Shreddage 3 Archtop takes our incredibly popular Archtop: Hollowbody Electric Guitar instrument and upgrades it to our cutting-edge S3 engine, adding brand-new samples along the way! The original instrument, featuring a six-string Sadowsky Jim Hall model with dual pickups, was favored by thousands of composers, producers, and bands for its playability and smooth tone. Now, you can enjoy these incredible samples with even better performance playback, strumming, articulation mapping, and tone options! Shreddage 3 Archtop,/strong. was performed by master session musician Josh Workman, who brought detail and nuance to every note. Each sample was cleanly recorded DI through a true analog signal chain for maximum warmth, making this guitar equally usable in both amped and clean contexts. While it is more than capable of hi-gain styles, Shreddage 3 Archtop truly excels with cleaner tones and genres like jazz, fusion, pop, alt rock, blues, funk, and R&B. Now, with the S3 engine, you can use the included Console FX rack and mixer to process and amp the instrument with no external plugins needed. Just choose from our dozens of included presets and you’re ready to play! All the articulations from the original instruments are here, and can be mapped or triggered however you want using Total Articulation Control Technology 2.0 (TACT). There are more ways to tweak and play these articulations than ever: dynamic layer and mute level adjustments, per-articulation velocity to volume, Strum Mode, and much more. Shreddage 3 Archtop includes an updated version of TACT, allowing you to customize how all articulations are mapped and triggered! Everyone has their own preferences for how to perform or write for virtual guitar, and with TACT you can create the perfect setup for your DAW. 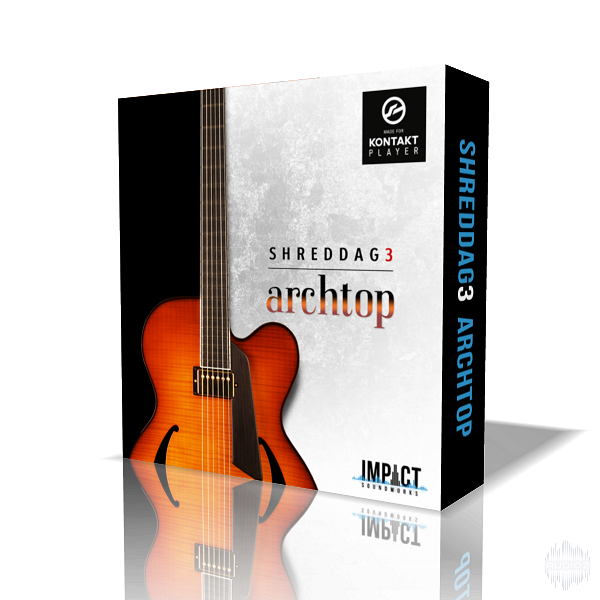 Impact Soundworks Shreddage 3 Archtop KONTAKT has been exclusively released on AudioZ by Talula who chose to ask not to post mirrors. Well this made my day. Gf just broke up with me but now I can make some sweet summer chill songs for myself with this bad boy. Already feeling better! Thanks, Talula! I hear "Production Master presents... the sound of Duko" in my nightmares. Thx to anybody posting Spitfire / OTB libs! This is a nice version in and of itself, but to my ears the older ver 1 of Archtop sounded better right out of the box.